There is no mistaking the luxury of Sea Island Resort. It begins the moment you travel down the long avenue; lined with palm trees, over the bridge with the large iron lanterns, through the guard gate where the pavement turns to a brick drive. Enjoying such luxury has become a little more affordable with a stay at The Inn at Sea Island. The Inn at Sea Island is part of the Sea Island Resort family that includes The Cloister at Sea Island and The Lodge, both Forbes Five Star properties. Although The Inn at Sea Island is not a Forbes Five Star recipient, a stay at The Inn is quite comfortable and affords guests access to many of the amenities available at Sea Island’s luxury properties located just minutes away. Plus sometimes you can find great deals for the Inn at Sea Island on Hotels.com. The Inn at Sea Island is actually located on St. Simons Island, just a mile from Sea Island. The Inn’s architecture is a Spanish Mission style; similar to The Cloister, with a clean transitional interior with calming blue hues giving it a classy beach feel. I liked the interior so much; I took pictures of the furniture to see if I could replicate one of the pieces for my front entry. The patio is spacious with several seating areas of comfy striped cushion couches and chairs, great for hanging out as a family. We picked up lunch from the Harris Teeter that is literally next door (you can walk over) and ate lunch on the deck at one of the tables. Beyond the seating area, past a privacy hedge is the pool. Back inside the hotel, is an in-house bar with two for one happy hour each evening from 5 – 7 pm, as well as a limited bar menu. Breakfast each morning is available for $10 per adult and $8 per child. It’s billed as a continental breakfast, but is an upgraded version of mid-tier hotel breakfast bar. There is the requisite waffle maker, as well as an assortment of breads and muffins, oatmeal, grits, eggs, bacon or sausage, yogurt, granola bars, fruit, etc. We’ve been to quite a few hotel breakfast bars, and what set this one apart was the hot food. The bacon was crispy, not limp. The oatmeal sweet, with a nice consistency, and real eggs, not egg substitutes. Our room at The Inn at Sea Island was super spacious (rooms average 400 feet) and included a king bed and sleeper sofa. We could have easily added a blow up bed on the floor as well and not been crowded. My tween and two teen boys stayed in a room with two doubles and my youngest slept on the sleeper sofa. I promised him he could switch with one of his brothers for the bed if it was too uncomfortable. He stayed on the sleeper two nights without even mentioning it again. Each room had a good-sized refrigerator and coffee machine. I don’t drink coffee, and would have liked tea bags in the room, but tea, coffee and grapefruit infused water was available for all guests in the lobby. Call me crazy, but one of my favorite amenities was the complimentary washer and dryer, complete with Tide capsules. I guess having to spend my evenings and my quarters washing lacrosse jerseys during our travel sports trips has given me an appreciation for such things. There is also a small fitness center, and a business center where guests can print off boarding passes, or find the latest newspaper. What intrigues me the most about The Inn at Sea Island is the opportunity to experience the luxuries of The Cloister or The Lodge at Sea Island (the brand’s Forbes five star beach and golf resort). Rooms at the Inn at Sea Island start from $185, depending on the day of the week, significantly less than rooms at The Cloister or The Lodge. As a guest of The Inn at Sea Island, you are granted access to all the Sea Island amenities (there is an additional fee for the Beach Club, which we’ll talk about later). The only other way to access these amenities is to be a Sea Island member, or stay at The Cloister or The Lodge. So what does that mean? A lot. There is so much to do at Sea Island that I don’t know if we’d have enough space in this blog to go over it all. So instead, here is how our three days and two nights were spent. Check in for The Inn at Sea Island is 4 pm, so we headed to the Shooting School at Sea Island to learn how to shoot clays first. My oldest and I shot clays while at the Old Ninety Six Historic District in South Carolina, but the others had never shot before. The Shooting School at Sea Island is in a small round building, and the only original resort structure. The dark wood and leather interior give it more of a hunting lodge look than a beach feel. The boys did great under the tutelage of our instructor Chuck. He uses an instinctive approach to training and it worked. My middle son missed just one clay the entire outing. If you know of shooting scholarships, please email me. The others got progressively better as we went through the stands. Although my shot wasn’t great, I did like the Beretta a400 guns. They were a lighter weight and had a lot less recoil than the ones I’d shot with before. Even my 12 year-old was able to handle them with relative ease, and without fatigue. Last time we shot, just holding the gun up was difficult. The Beach Club at the Cloister set up is unique and perfect for families. It is where people gather and where families can just hang out, with activities for every age. The Beach Club at Sea Island is the heart of the resort. After entering the club, head down the breezeway large enough for a family of five to walk abreast, past the professional photos for sale showcasing the previous days fun, beyond the shop with all the essentials you forgot, and maybe a few you just need. Past Wonderland, the candy and ice cream shoppe (if you can pass up all those sweets), the entrance to Southern Tide, a casual family restaurant, and the outdoor bar, beyond the Snack Shak where you can get some killer fish tacos, there are three pools, a splash pad and a baby pool, all expertly separated by ‘rooms’ of shrubs and trees. Also near the pools is a video game room where kids can play old school video games or ping pong in air conditioned bliss. We found out too late all the games are complimentary. There is also a teen lounge with a pool table, TV and a place to stay cool and hang out. Beyond the pools are two additional outdoor “rooms.” The play area, with beach volleyball, a half basketball court for the teens, shuffleboard, and a playground. The next “room” is the beach where lounge chairs and umbrellas await. 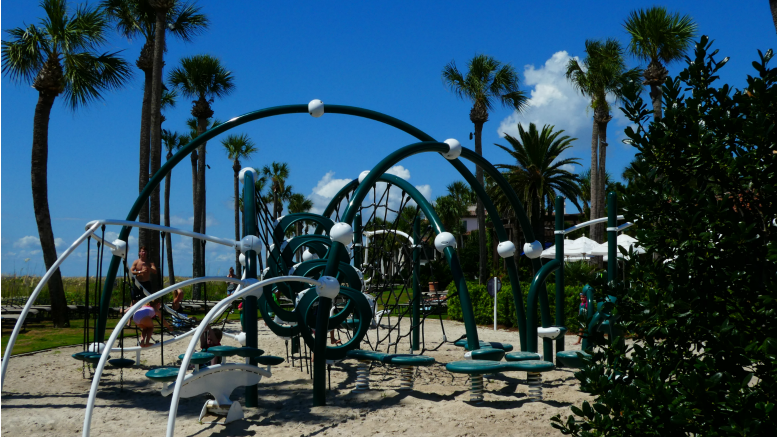 Isn’t this an awesomely cool playground! The beach is on one side, and the pool on the other. If guests at The Inn at Sea Island would like visit the Beach Club, they can do so for an added fee. Access to the Sea Island Beach Club at The Cloister is an additional $25 – $200 a night depending on day and season. Guests can opt to add this on for just one day or their entire stay. 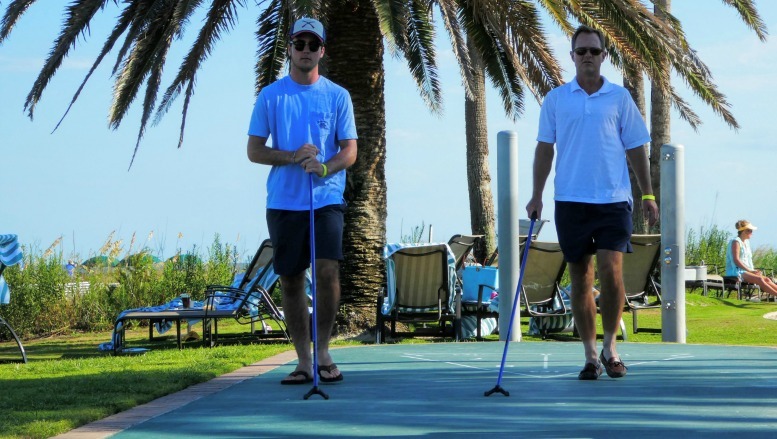 See our post on The Cloister at Sea Island for more on the Beach Club and the fantastic junior counselor program for kids. Note there are some black out dates where you are not able to purchase Beach Club access. If the Beach Club is important to your stay (and if you visit in the summer with a family, it will be) be sure to confirm access, or purchase that upgrade when you book your room. Fish tacos from The Snack Shak – delicious! One of my favorite parts of our stay at Sea Island Resort was dinner. The best part of the evening was being together over delicious food, trying new things, and just talking to my boys. Now that they are older (tween and teens) they are interesting, funny, and can enjoy sitting around a table just talking. The Inn at Sea Island doesn’t have a restaurant, but you can order pub grub at Irons during happy hour from 5 – 7 pm daily. A better option is to try one of the seven restaurants within the Sea Island family, including the Forbes Five-Star Georgian Room at The Cloister. And if you par-take a bit too much in the extensive wine collection at any of the establishments, use the Sea Island transportation between The Inn and The Cloister to get home. My palette, and my children are not sophisticated enough for the Georgian Room, but we did enjoy the family friendly options below. The first evening we ate at Tavola a rustic Italian eatery, and one of three restaurants in The Cloister building at Sea Island. If it’s a cool night, ask to be seated outside where you can watch the sun set on the marsh. In the heat of July, we sat inside and watched the chef spin pizza in front of the brick oven. Everyone had a tough time deciding on an appetizer and meal, so our wonderful waiter told us it was perfectly permissible to do half of one entry and half of another. Between the five of us, I think we tried all the pasta dishes. My favorite, the Tordelli Fromaggi, a spinach ricotta filled tortellini with spring vegetables, golden tomato and a balsamic glaze. It was a bit lighter than the other choices. For an appetizer, we ordered two small pizza’s so we could taste the Tavola with it’s house made sausage, rapini and aged gouda (it was the gouda that got us), and the evening’s special that included spec, a delicacy we discovered during our slumber party at The Loew’s Atlanta. The younger two were quite adventurous trying the Polpi Al Ferro salad with flat iron grilled octopus. They both seemed to like it. At Southern Tide it is perfectly permissible to wear your beach coverup. However, most people were showered and dressed for dinner – except us. On our second day, we tried three eating establishments at the Beach Club, the Snack Shak, Wonderland and Southern Tide. The Snack Shak fish tacos were the bomb for lunch, and the free chips and salsa kept the teens hunger at bay until their burgers and chicken fingers arrived. Afterwards we treated ourselves to ice cream at Wonderland, the candy/ice cream shoppe on site. The Gold Brick Sundae is a classic at Sea Island Resort, so of course we had to try that, and since the boys didn’t want to share, I simply HAD to get my own two scoops topped with gold brick sauce, whipped cream and a cherry. I justified it by saying I didn’t partake in a frozen margarita at the outdoor bar and those calories would have been roughly the same. After a long hard day relaxing at The Beach Club, we didn’t even bother to go back to The Inn at Sea Island to get showered and changed, we just headed to Southern Tide, the casual southern cuisine restaurant at The Beach Club. I will say that we were probably the only ones in there at 7 pm that were still in cover-ups and bathing suits, but I specifically asked if we’d be ok in our attire and was told that it was fine. Southern Tide uses local farmers and purveyors for their dishes, and the fish selections were all locally available. If you are really hungry, get the Southern fried chicken and waffles. Even my hungry 16 year-old needed some help finishing it. But after tasting his brother’s house made gooey cake with blueberry ice cream dessert, he found a little room in his stomach to order his own dessert. One of the biggest patrons of The Inn at Sea Island are golfers, because a stay here includes access to tee off next to one of more than 10 resident PGA pros who call Sea Island home, including Davis Love III, Zach Johnson, and Matt Kuchar. Guests of The Inn also have access to some of the highest ranked instructors in the country at the Golf Learning Center. These professionals help golfers of all skill levels – from novices to PGA professionals – improve their game through personalized, hands-on expertise in a variety of areas, including putting, sports psychology, fitness, club fitting, and swing analysis. Guests also have the opportunity to play Sea Island’s three 18-hole championship courses. The Seaside Course, which, along with Plantation is home to the PGA TOUR’s RSM Classic, is a true links-style course with ocean vistas. The Plantation Course winds through marsh and forest, while the Retreat Course offers a uniquely dramatic and challenging design cultivated by Davis Love III and Mark Love. On a previous trip to Sea Island, we fished off the dock outside The Cloister. This is also a great place to lower a few crab nets and see what you can catch. On this vacation, we went out with Captain Dooley for some seaside fishing. Almost as soon as our lines were cast, we started catching croakers, a fish that makes a crocking sound like a frog. The water was pretty warm and it was hot on the boat, but we did catch a few bigger fish, including a spotted trout, and a small shark. One of the boats near us pulled in a huge sting ray. We released our catches, but you can bring them back and have the chefs at Sea Island clean and fix it for you. The Forbes Five-Star Spa at Sea Island Resort is a true treat. This is the lobby. Just the lobby. Imagine what awaits! While my boys played at The Beach Club, I slipped way to the Spa at Sea Island for a tour, and probably the best massage I’ve ever had. It’s amazing how fast 60 minutes can go when you are being pampered. The Spa at Sea Island Resort is a lot more than just treatment rooms. Plan to get there early and stay late, to take advantage of the hot tub, pools, steam, and sauna. Or, just bring your favorite book, and get lost in another world among the lush plants inside or out, while listening to the calming sound of a waterfall. Just walking into this space makes you lower your shoulders and exhale. Check out on our last day was noon, so we headed to Rainbow Island to take advantage of the water sports (you can also rent a Hobie Cat on the beach at The Beach Club). Whenever you go out in the marsh, try to do so at low tide, you’ll see lots of beautiful birds looking for their next meal, and the lower water concentrates the sea life, plus if you get out on one of the sand bars, or the beach, and play in the pluff mud, a quick sand like goo that my boys loved. Bring a small container to take some home for a spa worthy mud bath, or just have fun marching in it and squishing around like we did. Paddleboarding was my favorite activity during our stay. Ian, our guide was very knowledgeable about the sea life, and the resort. He also gave the boys tips on how to spin the paddleboard, and other ways to do a little horsing around. Hint: move up and down the board, not shake it side-to-side if you want your brother to fall off while you stay on. Our Sea Island Resort stay ended much too soon. We only skimmed the surface on all the activities. Next time, I want to try Falconry at Broadfield, Sea Island’s hunting plantation. As much as I enjoyed our stay at The Inn at Sea Island, I think it is important to note that a stay here is not a cheaper version of a stay at The Cloister or The Lodge. It simply allows you to access the luxurious amenities at those Forbes Five Star resorts. While I would describe The Inn at Sea Island’s accommodations as premium, they are not as luxurious as The Cloister or The Lodge, and there is no bell service, valet, on-site concierge or room service. For me, that isn’t a big deal. I like to carry my own bags, park my own car, and can’t remember the last time I ordered room service. However, if you are looking for those amenities, you won’t find them at The Inn. In addition, the actual rooms are different as well. I have not stayed at The Lodge, but have enjoyed a vacation at The Cloister. Five years and lots of hotels later, I still dream about the bed there. The Inn at Sea Island has fluffy, full pillows, but the bed, although comfortable, doesn’t tease you into lingering all day like it does at The Cloister. For more about our stay at The Cloister, and our room there, see my post on The Cloister at Sea Island. Maybe it’s all the people milling about at The Beach Club, kids running in packs, parents mingling in the pool, at the bar. Whatever it is, that magic is broken when you leave the property each night to go back to The Inn, and the reason that some will opt to pay the additional price tag to stay at The Cloister rather than at The Inn. Is that magic worth the price difference? Only you can decide. Be the first to comment on "The Inn at Sea Island: Inspired Luxury for Less [video]"